This project was created on 10/25/2018 and last updated 5 months ago. 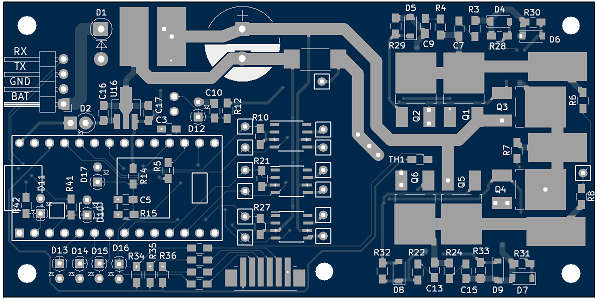 Conceived as carrier board for the Arduino compatible Teensy 3.2 MCU Board. The carrier essentially bears the MOSFET switches and gate drivers. It also has a linear step down regulator for the MCU, a NTC temperature sensor, a current sensing resistor, and a big filter capacitor. The firmware is Arduino-based custom code. Electrical & characteristics: 12 V supply voltage. It should withstand 5 A phase current. For continuous operation, a heat sink will probably be required. Carrier board: Because an Arduino compatible uC board is simply too convenient. 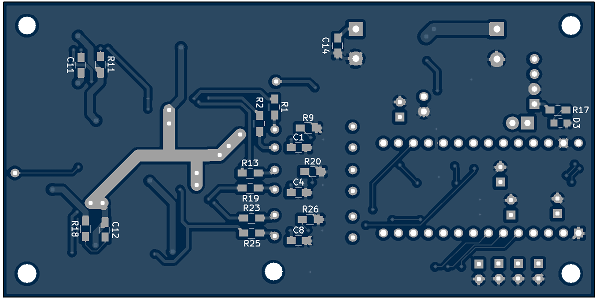 Custom PCB: Makes it simple to use SMD parts, and also I do not like soldering connections. Block commutation: Is simple to implement. It would be interesting to try modern schemes like space vector modulation and field oriented control. However, I learned about that after designing the hardware. So it is not supported. Speed control: Implemented by a PI controller. It takes a speed estimate and the desired speed and computes the pwm magnitude. The speed is estimated by measuring the time between state changes of the Hall effect sensors in the motor. I tuned the controller with some trial and error. Current limiting: One of the two ADCs is configured to measure the phase current during the “on” phase of the PWM cycle. If the current is larger than some threshold, the duty cycle is zerod for a brief period. The measurement is done over a current shunt on the low side and measures the total phase current. Digital communication via UART : I desire reporting of various quantities, like supply voltage, current, RPM, etc. Therefore a solution more sophisticated than the usual pulse position modulated signal was required. See below. These components were selected for low Ron and switching time between 0.1 and 1 us. But there are other specs that play a role, like breakdown voltage, price, package size and thermal resistance. The average voltage applied to the motor is controlled by applying a 20kHz PWM signal to the high-side bridge, switching the corresponding coil between Vbat and Gnd. Which bridge is currently high-side is determined by the block commutation scheme, depending on the rotor position. Protobuf: For (de)serialization of messages. The protobuf compiler conveniently generates an API for each message definition. There is an implementation suitable for micro controllers called nanopb. COBS framing: Protobuf does not handle framing, i.e. providing information about the start and end of a message in the raw byte stream. I chose the COBS method to do that. I am aware of MavLink. However, I am familiar with protobuf. Hence my choice. Generously sized … The area on the right is intended to allow mounting a standard PC chipset heatsink on the MOSFETS. On Github. It might not be the best structured or most readable. I do some low level control register manipulation. So be warned. Well, it drives my RC car around. Only tested under light loads, while driving indoors. Little regard for fail safety. Current limiter is pure software implementation, and therefore slow. Dual 3.5A motor driver with built-in signal inverter for LAP control. Car electronics projects for home built cars and hot rods. It includes a capacitive fuel sender interface and a wiper synchronizer. You are about to report the project "BLDC ESC", please tell us the reason.